Born in Germany in 1979, Daniel Sannwald is emerging as one of the true original voices in contemporary photography. In a landscape dominated by referential and repetitive imagery, Daniel is establishing a strong and recognizable signature that is already catching the attention of some of the most influential trendsetters in the fashion and photography industries. His surrealistic and hauntingly beautiful images speak of a world were Fashion and Art meet to reveal a unique narrative. 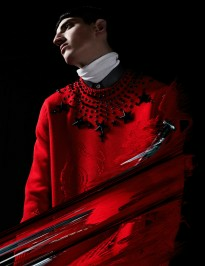 Daniel studied at the Royal Academy in Antwerp (MA Honours) and is now based in London. Daniel regularly contributes to some of the most influential fashion magazines - 032c, 10 Men, Arena Homme +, Dazed & Confused, i-D, PoP Magazine, V Magazine and Vogue Hommes Japan, Vogue Russia, Vogue UK.